Here's a tag for Hels Sunday Stamper challenge 188 with the theme Gold. For the background I embossed the Oak House Studio Walesby Flourish stamp and then blended Bundled Sage Distress Ink over it. It's spritzed with gold perfect pearls and edged with Gold Dabber. 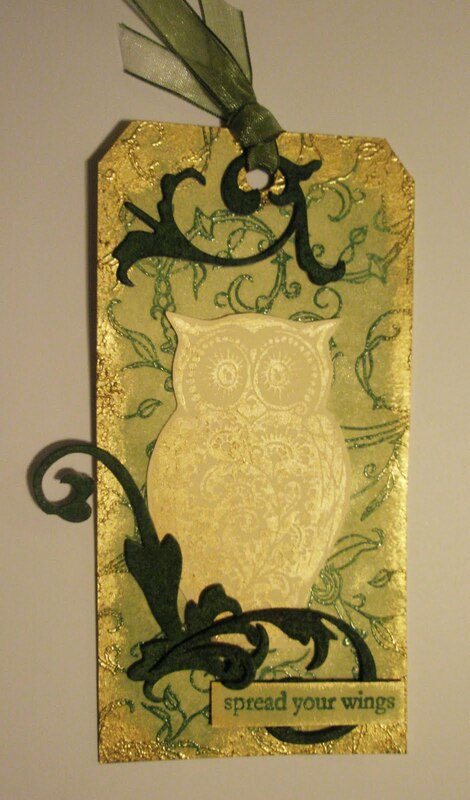 The owl is an Elusive Images/Chocolate Baroque one stamped with gold dabber. The tag is just finished with a few flourishes, some ribbon and the phrase 'Spread Your Wings'. I couldn't get the owl to show up very well but they are naturally quite shy! !